distances from this point, and hence will not arrive in the same phase, and the brightness will be less than at p. At a certain distance pq there will be no light at all. This occurs when the difference of phase between the extreme ray and the central ray is half a wave, that is, calling the wave length Z, when cq — bq = £ I; for these two pairs of rays destroy each other, and the same is true of every two such pairs of rays. The same is equally true of every point about p at this same distance; hence there will be a dark ring about the bright image. This is succeeded by a bright ring, a second dark ring, and so on. Draw qt at right angles to bp. Then cq — bq = %l. 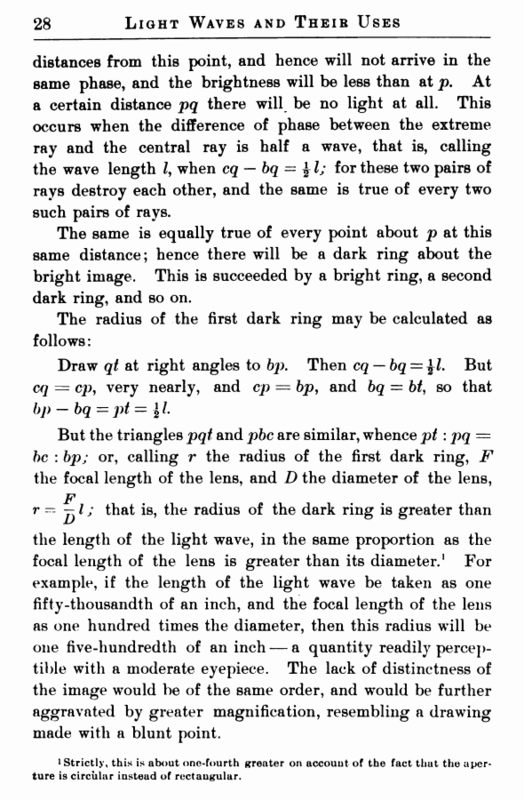 But cq = cp, very nearly, and cp = bp, and bq = &/, so that bp — bq = pt — 11.
the length of the light wave, in the same proportion as the focal length of the lens is greater than its diameter.1 For example, if the length of the light wave be taken as one fifty-thousandth of an inch, and the focal length of the lens as one hundred times the diameter, then this radius will be one five-hundredth of an inch — a quantity readily perceptible with a moderate eyepiece. The lack of distinctness of the image would be of the same order, and would be further aggravated by greater magnification, resembling a drawing made with a blunt point. i Strictly, this is about one-fourth greater on account of the fact that the aperture is circular instead of rectangular. In most cases these diffraction rings are so small that they escape notice, unless the air is unusually quiet and the lens exceptionally good. 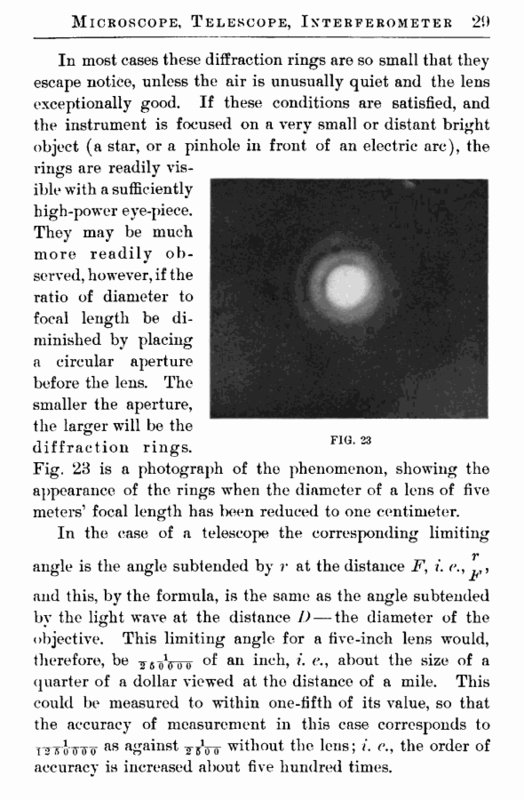 If these conditions are satisfied, and the instrument is focused on a very small or distant bright object (a star, or a pinhole in front of an electric arc), the rings are readily visible with a sufficiently high-power eye-piece. They may be much more readily observed, however, if the ratio of diameter to focal length be diminished by placing a circular aperture before the lens. The smaller the aperture, the larger will be the diffraction rings. Fig. 23 is a photograph of the phenomenon, showing the appearance of the rings when the diameter of a lens of five meters’ focal length has been reduced to one centimeter. angle is the angle subtended by v at the distance F, ?. quarter of a dollar viewed at the distance of a mile. This could be measured to within one-fifth of its value, so that the accuracy of measurement in this case corresponds to TTToinro" as against ^sVo without the lens; i. c., the order of accuracy is increased about five hundred times.